The 2012 Jeep Patriot stays true to its rugged roots with high marks in off-road performance and no-nonsense practicality for outdoor warriors on a budget, yet it takes to paved roads with almost as much grace as its pricier crossover competition. Any ute with rear legroom, cargo capacity, acceleration and a decent cabin will give the 2012 Patriot a run for your money. Rumors flew for years about Jeep's new CVT for the 2012 Patriot, but the change didn't change anything. 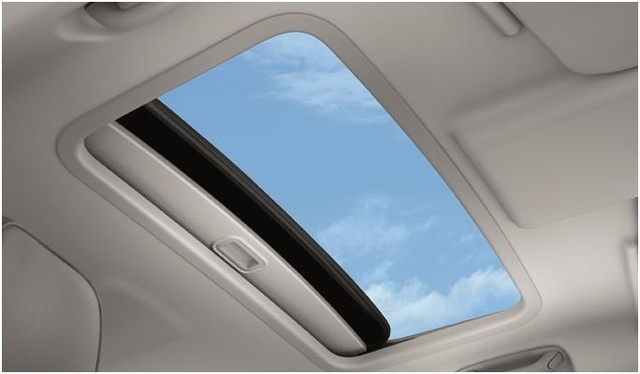 What's more, some standard features, like the sunroof, have been quietly moved to the options list. Nevertheless, the 2012 Patriot is an exceptionally strong contender when it comes to car-like off-road conquest, especially given its sticker price and unique considerations. Building on last year's performance improvements, Jeep made just a few tweaks for 2012 and returns the Patriot to its familiar trim lineup. The Limited is back after a short hiatus, reclaiming its throne at the top of the line from last year's Latitude X with a few slight feature differences. The base Sport and mid-range Latitude continue into 2012 virtually unchanged, except, of course, for the continuously variable transmission (CVT), which was supposedly modified to improve performance in all Patriots. However, early drivers note there does not appear to be any discernible difference between the 2011 CVT and the 2012 CVT. Through hard turns and over rough pavement, slapping it into gears with the auto-manual functionality or using it fully automated, one driver couldn't find a single difference after driving the two back to back and parking them side by side. The numbers don't speak any differently, either - fuel economy, horsepower, torque, towing capacity and 0 to 60 times remain exactly the same. 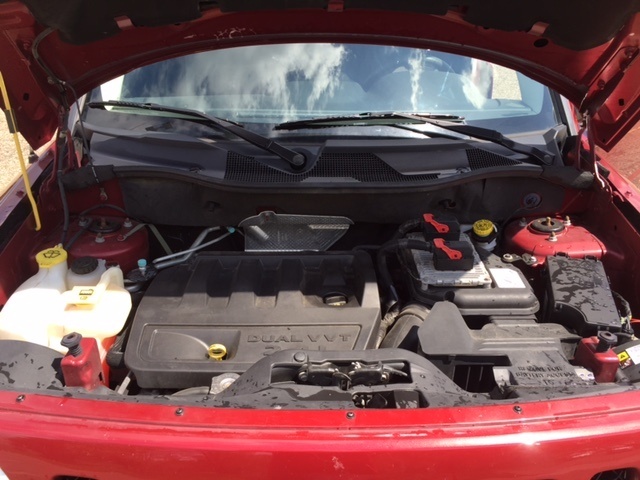 Nevertheless, this "new" CVT is standard equipment for the Limited and optional for the Sport and Latitude, which receive a 5-speed manual by default. The Limited also gets the bigger 2.4-liter engine, as does every Patriot equipped with 4-wheel drive (4WD), but it is also available in the front-wheel (FWD) Sport and Latitude, which receive the 2-liter otherwise. As expected, two 4WD systems are available for greater traction in any Patriot. Freedom Drive I offers traction on demand for slippery road surfaces, while Freedom Drive II is a full-time 4WD system that behaves like a locking differential with low gearing and is really suited only to off-road expeditions. Either system is capable of making a better-than-average compact companion for the outdoor warrior and 4 friends - but when it comes to crossover comforts like legroom, newfangled gadgets, a quiet ride and impeccably smooth suspension, there's plenty of competitors that have those in spades, but they won't come as inexpensively or strongly trail-rated. 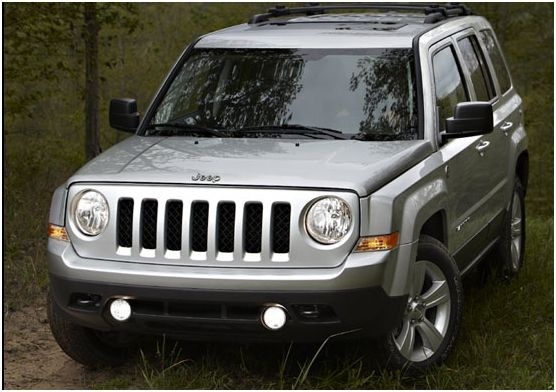 The 2012 Jeep Patriot is available with your choice of two 4-cylinder engines, a manual or continuously variable transmission, and FWD or one of two types of 4WD for all your outdoor pleasures. Whatever the setup, you can expect 2,000 pounds of towing capacity on tap with the optional towing package and a leisurely pace - even the bigger 2.4-liter makes it to 60 mph after 10 seconds. The base Sport and mid-range Latitude come off the griddle with a 5-speed stick, FWD and the 2-liter engine good for 158 hp and 141 lb-ft of torque. The Limited takes the CVT, 4WD and the 2.4-liter engine by default, pumping out an extra 20 points on each spec, making a total of 172 hp and 165 lb-ft of torque. The 2.4-liter is available for the Sport and Latitude with or without 4WD, but opting for Freedom Drive I nets the bigger engine, too. Freedom Drive II affords a low-range transfer case, full-time 4WD and acts like its own locking differential, but all that functionality comes at the cost of regular-grade fuel efficiency. A FWD Patriot with the 2-liter on a stick rates 23 mpg city/29 highway, while a FWD 2.4-liter on a stick does only slightly worse at 23/28. The CVT eats a couple extra gallons for about 23/27 in the same environments, but Freedom Drive II is decidedly most thirsty at 20/23. All 4WD-equipped Patriots feature automatically locking hubs, electronic hi-lo gear selection and a center locking differential. Freedom Drive II additionally offers dual-range gear ratios for inching your way over steep obstacles. Any Patriot equipped with Freedom Drive I can opt for the Off-Road Group, which adds Freedom Drive II, all-terrain tires, skid plates, tow hooks and hill descent control. Last year's suspension overhaul has been very well received. Drivers and reviewers alike commend the Patriot's significantly decreased wobble and wiggle thanks to the addition of heavier duty sway bars, shocks and struts. Steering likewise benefitted from the suspension makeover and is touted as confident and accurate, despite some lingering body roll. All in all, these improvements make the Patriot a rather firm ride, but not uncompromisingly so — especially with the pavement-friendly suspension tuning for the FWD Patriot. However, if you're looking for a truly car-like ride to go with that car-based unibody, the Patriot's blatant road noise and cramped, hard rear seating will be a disappointment. This Jeep is still primarily for off-road use, and for that it gets high marks. Acceleration will be another downer for speed-seekers, as the Patriot takes a full 10 seconds to get up to 60 mph. The Patriot is not speedy, and it's not a plush land yacht, either. With optional all-terrain tires to replace the default all-seasons on the 16-inchers for the Sport or 17-inch alloys for the remaining trims, the Patriot is instead built to go anywhere to the beat of its own drum. 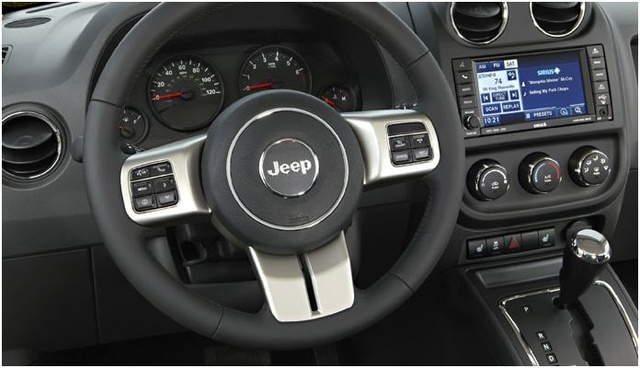 Although you won't be going anywhere fast, the gauges and controls are nevertheless bold and useful, with easily read markings and readily found knobs and buttons - as you would expect in any Jeep. However, you're probably going to end up holding a few things in your lap, since cubbies are few and far between. Sure, there are cupholders for front and rear passengers, but the only storage usable from the seats include a glovebox, center console compartment and front door pockets. Stepping inside the 2012 Patriot unveils an interior just as rugged, simplistic and utilitarian as the outside. Hard but easily cleaned plastics are the primary focal point everywhere you look, excepting a few metallic and sometimes leather accents. Moving up to the Limited will net leather upholstery, while the midrange Latitude offers a multifunction leather-wrapped steering wheel, but otherwise the interior is a plastic-lover's dream come true. The default upholstery claims to be cloth, but it looks and feels like plastic - which is great for cleaning, but could lead to a couple sticky situations. The base Sport offers 60/40 folding rear seatbacks, while the Latitude ups the ante with an added reclining function for the rear seats, heated front seats, height-adjustable driver seat and a fold-flat front passenger seat. The Limited additionally powers up the driver seat for six ways to comfort, but none of the seats are especially sculpted, instead preferring a rather flat and firm form that rubs some folks the wrong way. You won't find a lot of room in the trunk of this compact ute, with just 23 open cubes between upright seats and the tailgate. Cargo tie-downs are standard and just might come in handy when you open up all 53 cubic feet available after folding down every passenger seat. Interior space is not the Patriot's strong point, as even rear legroom could use a few extra inches - especially in the middle seat. Although it's not loaded down with gizmos, the 2012 Patriot does come pretty decently equipped for the price. Air conditioning is optional, but the Sport otherwise features foglights, rear privacy glass, roof rack side rails, cruise control, outside temperature display, tilt-only steering wheel with audio controls and a 4-speaker sound system with a CD player and auxiliary audio jack. It can be optioned up with the Power Value Group to include keyless entry, full power accessories and heated mirrors. The Power Value Group and air conditioning come standard in the Latitude alongside remote ignition, a 115-volt AC power outlet and trip computer. At the top of the line, the Limited offers automatic climate control and an upgraded sound system with a 6-CD changer and satellite radio. However, every Patriot features several nifty considerations for your outdoor adventures - including a removable cargo light that doubles as a rechargeable LED flashlight. Jeep offers several option packs that are available almost universally, but Sport owners will find themselves spending more for a la carte options since the packages as a whole are not available for that trim, and some options are not available to it at all. For instance, the Latitude and Limited can opt for the Security and Cargo Convenience Group, which offers daytime running lights, roof rack crossbars, remote ignition, cargo cover, auto-dimming rear-view mirror, Bluetooth and front-seat side-impact airbags. The only options from that list available individually to the Sport are Bluetooth and the extra airbags. Also available to all but the Sport is the Sun and Sound Group featuring a sunroof and a 9-speaker Boston Acoustics sound system with 2 flip-up speakers in the tailgate, but only the stereo setup is available individually. Standard safety equipment for every 2012 Patriot includes antilock brakes, stability and traction control, active front head restraints and side curtain airbags. Front-seat side-impact airbags are optional for all trims, but disc brakes for all 4 tires are only available in the Limited's standard equipment. As such, the Patriot stops from 60 mph in a long 143 feet — about 20 feet longer than the average for this class. Without the optional side-impact airbags the Patriot receives a Marginal score, the second-lowest mark, on side impact tests. With the optional airbags that rating bumps up to the best rating, Good, which it also receives for frontal-offset crash tests regardless of options. The Patriot does not offer any newfangled gadgets to prevent accidents either, unlike much of its competition, but to be fair, most of its competition also has worse outward visibility. If there is a single unhappy Jeep Patriot owner in the last 2 years, I couldn't find him. Every single driver rates the 2011 and 2012 Patriot with at least 4 out of 5 stars. Be it new owners, returning Jeep fans, drivers new to the Patriot or long-time drivers, after a few miles or an entire year, every single driver is consistently ecstatic about his or her favorite 4-wheeling companion. That said, a few drivers can't seem to get the Patriot's advertised fuel economy, good driving habits or not. It's not significant, just a couple mpg off the target — and some drivers are able to get better-than-advertised fuel economy, so it's probably a sort of manufacturing fluke. Most cars have at least a few lemons leaving the manufacturing line, so if that's the only shaky area - since I can't find anything else that would be a manufacturing issue - then Patriot fans are in luck. Jeep fans love the interior, calling it spacious and even "nice," but anyone more used to luxury vehicles is instantly turned off by the plastic overload and relatively close quarters. Some drivers note the CVT is a bit loud and sometimes sluggish, but this dies down after the first few hundred miles as the CVT gets used to being used and the auto-manual shifter is not only a suitable supplement, it's also very fun to use. Shorter drivers note a problem with outward visibility in the rear passenger corner, but the mirrors seem to do a good job of handling that little snafu. Drivers who ended up choosing the Patriot tried everything from the Nissan Rogue to the Subaru Forrester and still found the Patriot superior in everything from price to performance, gas mileage and apparent ability to handle daily driving without falling apart. The most common sort of driver transitioning to the 2011 Patriot, which has the same suspension upgrades as the 2012, traded in or previously owned a 2007 Patriot and consistently praise the current Patriot's massive leap in ride quality. The words they choose are most often along the lines of "nimble" and "car-like," right next to "comfortable" and just below "wow." 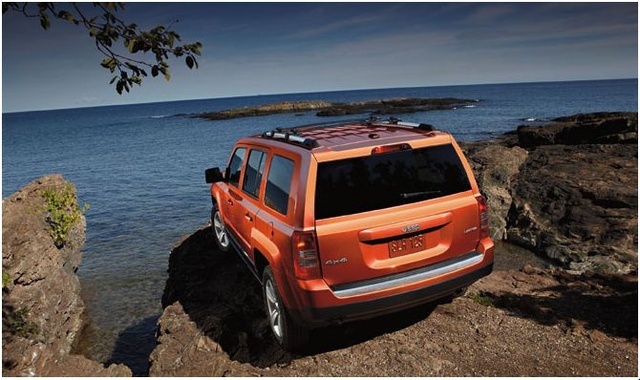 What's your take on the 2012 Jeep Patriot? AbbyThomas I loved my 2012 Jeep Patriot at first. It now has 35,500 miles on it. We are having problems with the transmission not wanting to back down the RMP's have reached over the 6,000 mark and wont drop till you hit the break. Along with that i can be driving down the road and it will jerk like its wanting to shift but wont. My husband and I have had it in the shop 5 times in the passed three weeks and nobody finds anything wrong when we take it in. I don't know what to do with it any more. We have been in contact with jeep and they have gave us a case number. So its now a waiting game. I would not recommend buying a Patriot. 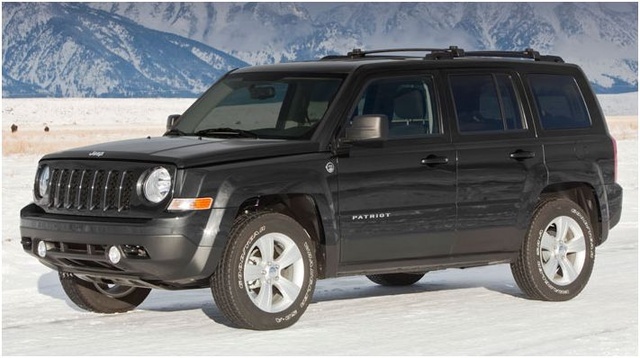 Timley We've owned a 2012 Jeep Patriot with 4WD, the bigger engine (2.4L) and 5-speed Manual since 12/2011. It is pretty much stripped down, except for air conditioning and the power group (electronic door locks and windows). We have almost 70K miles on the car and it still have the original tires. We have been contacted several times to trade it, but we haven't responded as yet. We just had the car inspected (PA) and the only thing the mechanic said was that we would probably need rear brake pads at the next inspection. We did have a Key FOB problem (actually, a bad receiver at about 20K miles) but that is the only problem. Luckily we bought the 99 year warranty which gives us peace of mind. By selecting that warranty, the dealer reduced our interest rate by 2%. One more thing, we get a pretty consistent 31 MPG on long trips. That is all! Very pleased! 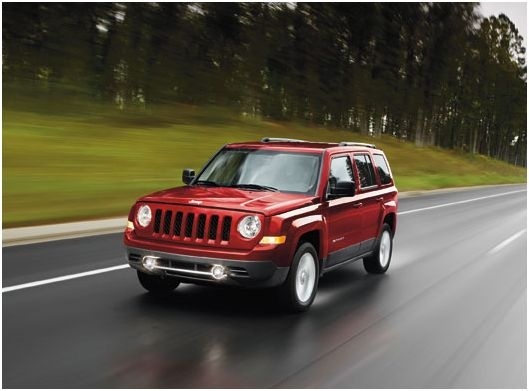 Have you driven a 2012 Jeep Patriot? Electric motor failed. Where is manual opener? Will 225/75/16 fit on a 2012 Jeep Patriot front wheel drive?